play video slots free Play for free and learn how the king of video slots Mega Fortune works. Then make a deposit, play and get started. 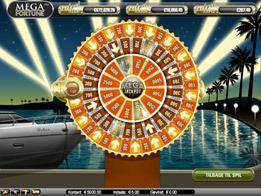 Mega Fortune is a reel casino jackpot classic, that's fun to play and easy to use. You can play Mega Fortune on 1 to 25 bet lines at 1 to 4 bet levels. The spin button lets you play the game at the current bet lines and bet level. Choose to play Mega Fortune MAX BET and play at the maximum bet lines, at the highest bet level, and at the pre-selected coin value. There’s even the option to Auto Play to make winning the Mega Fortune Jackpot even easier. What makes Mega Fortune video slot so special is the excitement and anticipation you'll get from not one but three jackpots! The Rapid Jackpot, The Major Jackpot and of course The Mega Jackpot! Start the fun at the Mega Fortune video slot, get through to the jackpot bonus game and spin the wheel of fortune. Take a spin of the outside wheel and stop it if you can, on an arrow. If you do, you'll go on to another spin of the wheel of fortune and even greater jackpot chances! In the Jackpot Bonus Game you can win either a jackpot or a fixed coin value. So how do you trigger the Mega Fortune bonus game? Easy. Just get three Mega Fortune bonus symbols on your activated bet line and you’ll go through! The first wheel gives a chance of a coin win or to play the next wheel. The second and third wheels give chances of a coin or jackpot win. Spin the wheels; if a wheel stops on a Jackpot, the Jackpot is yours!! Hit on a Free Spin and get more games for free! You’ll activate even more free spins when you get lucky and find three or more champagne scatter symbols, you’ll get the free spins in the same bonus round. What’s more, during free spins your winnings are multiplied up to 5 times. In free spins, 2 or more scatter symbols will activate additional free spins or a multiplier. The winning multiplier is automatically added to the current multiplier, the Mega Fortune maximum multiplier is 5.